Stems: Erect, 1 to several, mostly unbranched, rigid, leafy, silvery soft- or appressed-hairy. Leaves: Alternate, short-stalked to sessile, pinnately 3-foliolate; leaflets elliptic or oblong, 1 to 2 inches long, less than 1/2 inch wide, nearly glabrous or silky- or appressed-hairy above, densely pubescent below; margins entire; tips abruptly short-pointed. Inflorescences: Racemes, head-like, rounded, leafy, 10-45-flowered, terminal, on short stalks or sessile in upper leaf axils. Flowers: Less than 1/4 inch long; calyces bell-shaped, lobes 5, pointed; corollas papilionaceous, white or cream; banner longer than wings and keel, reddish purple spot at base; stamens 10, 9 united, 1 free. Fruits: Pods, oblong, about 1/5 inch long, hairy, enclosed in persistent calyces, 1-seeded; seeds flattened, shiny, brown to black. Habitat: Dry, upland prairies, old fields, roadsides, and open wooded hillsides, on sandy or well-drained soils. 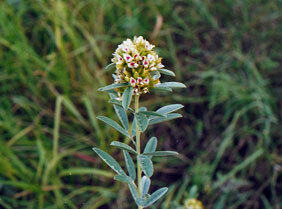 Forage Value: Round-head bush clover is a palatable and nutritious native legume that is readily grazed by livestock. Upland game birds consume the seeds. Uses: Native Americans made a tea from the leaves and burned pieces of moistened stem on the skin as a counter-irritant to treat rheumatism. Comments: The Pawnee called this plant "rabbit foot" because of the shape its flower heads. The roots of round-head bush clover grow 5-8 feet long.